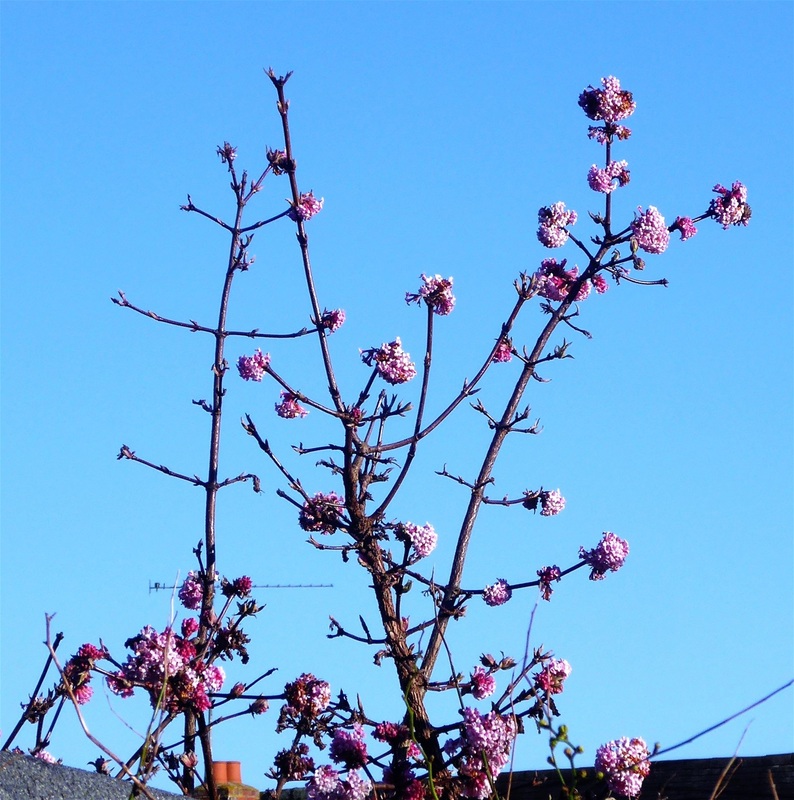 26th February - Freezing weather delays the Plan! With the ground frozen solid, planting the shallots will have to wait, but I have managed to get a few bits done under cover this week, with time out for coughing still. 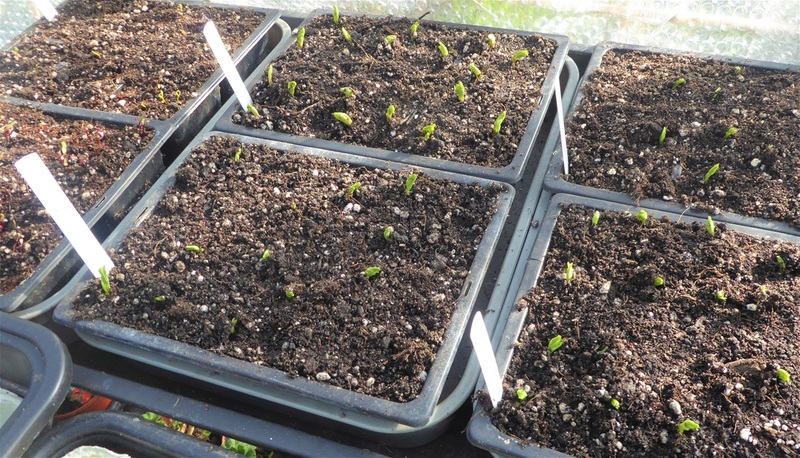 All the chilli, sweet pepper and aubergine plants have been potted on individually into three inch pots. I used a three way mix of coir, perlite and multi purpose potting compost, as this is light enough to let plenty of air to the roots. 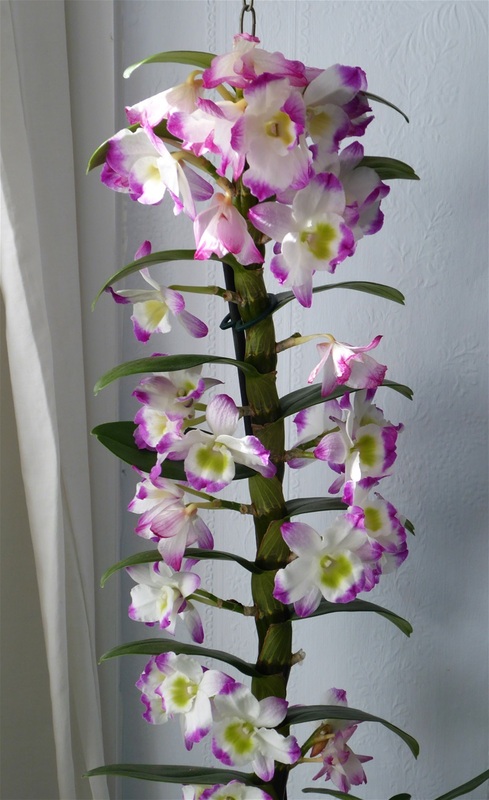 It lacks nutrients though, so I shall be feeding the plants weekly. They are just beginning to develop their first proper leaves, so it was the right time to move them on. I have far fewer plants than last year at around 50: so far the plan not to over-sow is working! This might seem a lot of plants still, but they have been carefully calculated to be enough for the polytunnel with some from friends and family. Interestingly, the variety slowest to germinate has been Hungarian Peach, which produce tiny but fiery chillies. They have only just popped up their heads, so are staying in their module for now. 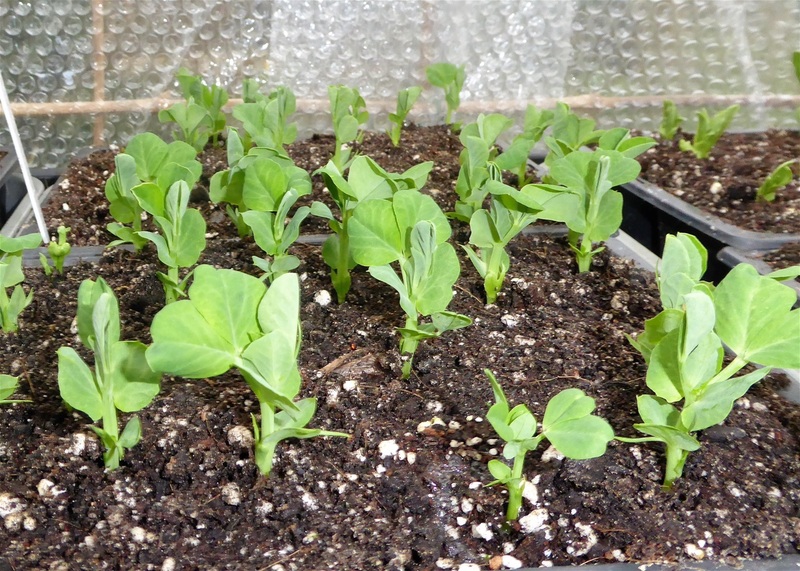 The mangetout, peas and broad beans are still in the greenhouse too, as with daytime temperature barely climbing above zero, the shock to their system of moving them out would set them back a lot, so hardening off will have to wait until the weather improves a bit. 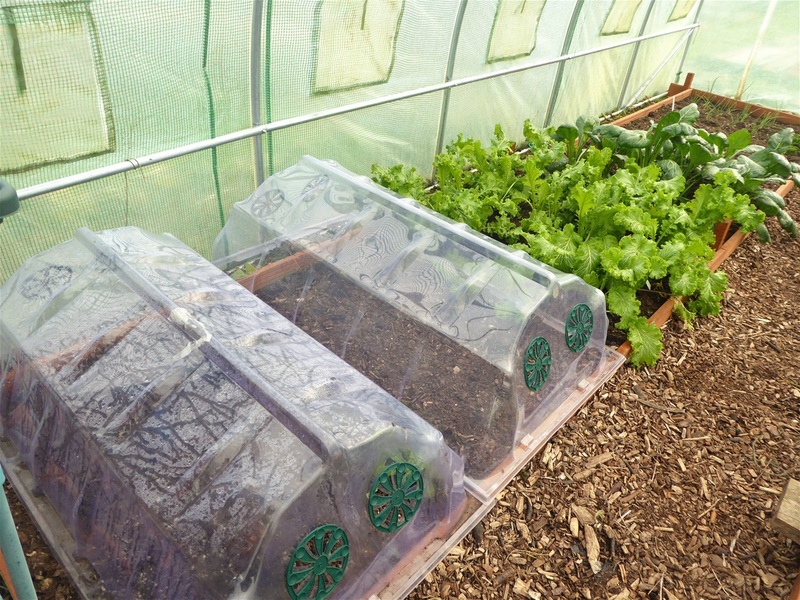 These large cloches are great. I use them at this time in the year to warm the soil slightly. These two are in the polytunnel over the spot where carrots will be sown soon, and a couple more will be going on the bed on Plot 146 that will have the second sowing of carrots. 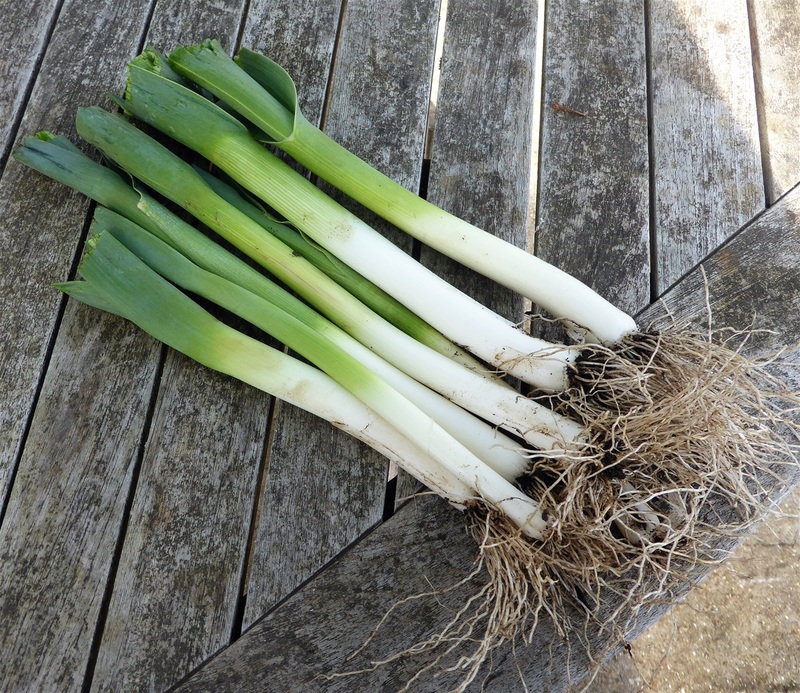 I just need to dig out the last few leeks and give the ground some blood, fish & bone first.... when the soil thaws! Next to the cloches you can see the mustard greens and Japanese mustard, which are looking good. 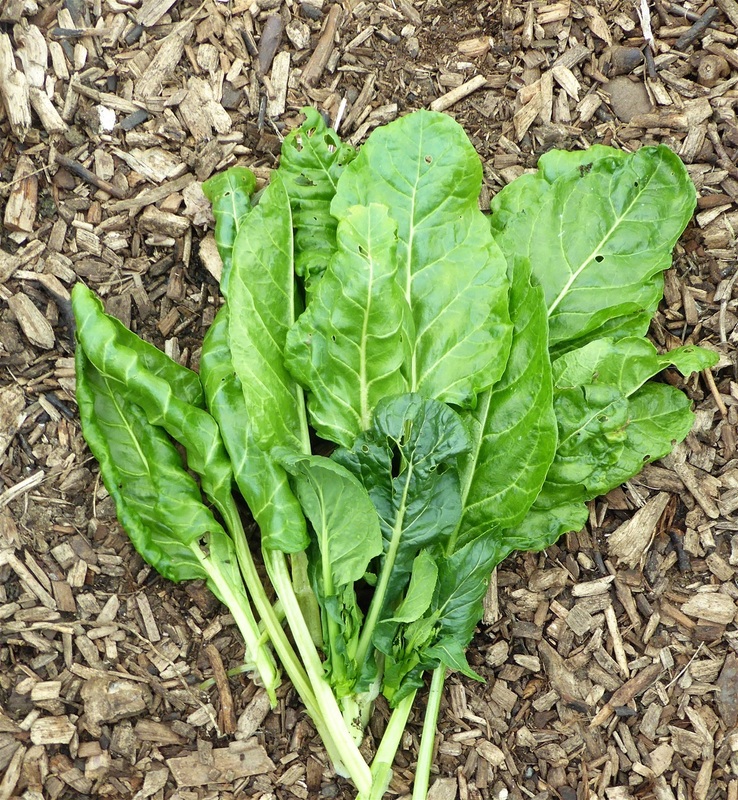 I harvested some of the Perpetual Spinach from the bed opposite today. This will be used for Spinach & Poppyseed bread tomorrow. When you have a lot of spinach, finding different ways to use it can be a challenge, so I hope this comes out well. NIce to have something to share for Harvest Monday! It is hard to believe that February is almost ended and in three days time it will be the beginning of what is termed "meteorological Spring", when sowing will begin in earnest. 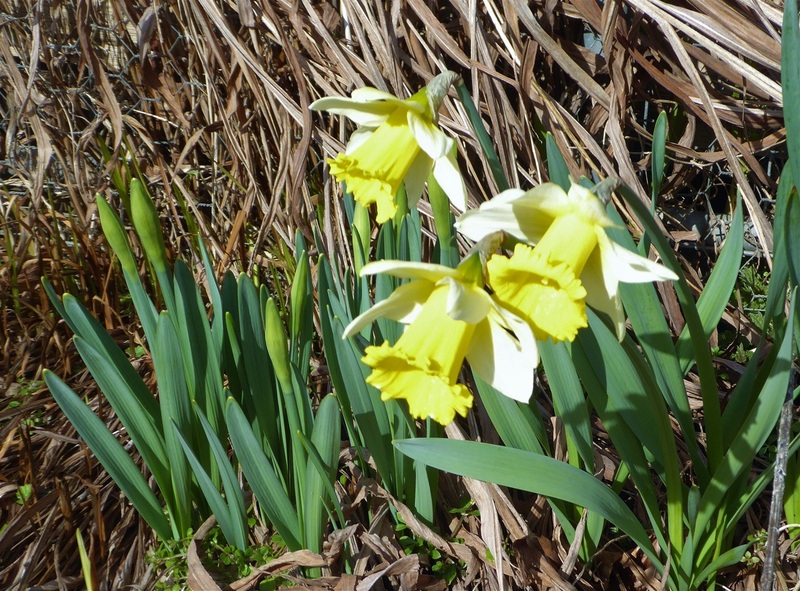 Daffodils are starting to come out in sheltered spots on the plots, and there are lots of fat buds in the garden at home too. 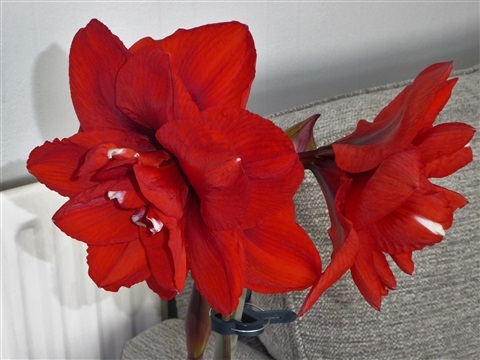 The most spectacular blossoms right now are those indoors: just look at these beauties! 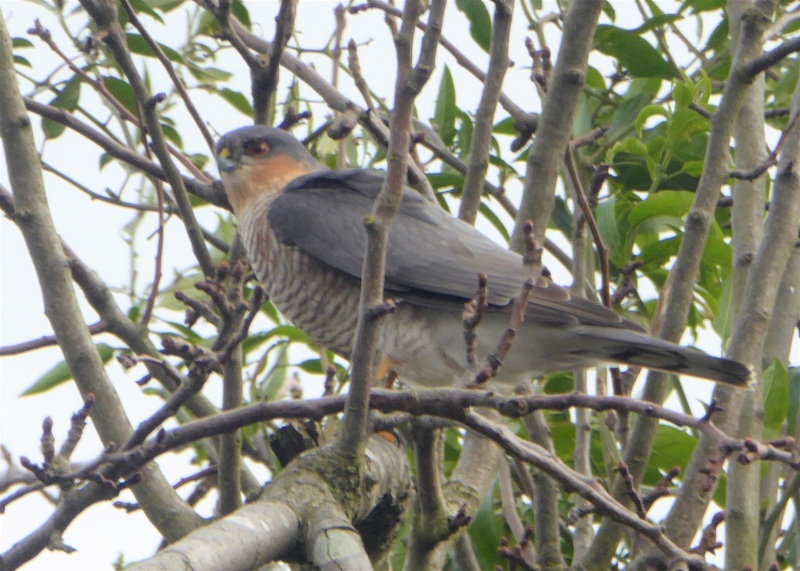 That is the end of this week's blog. 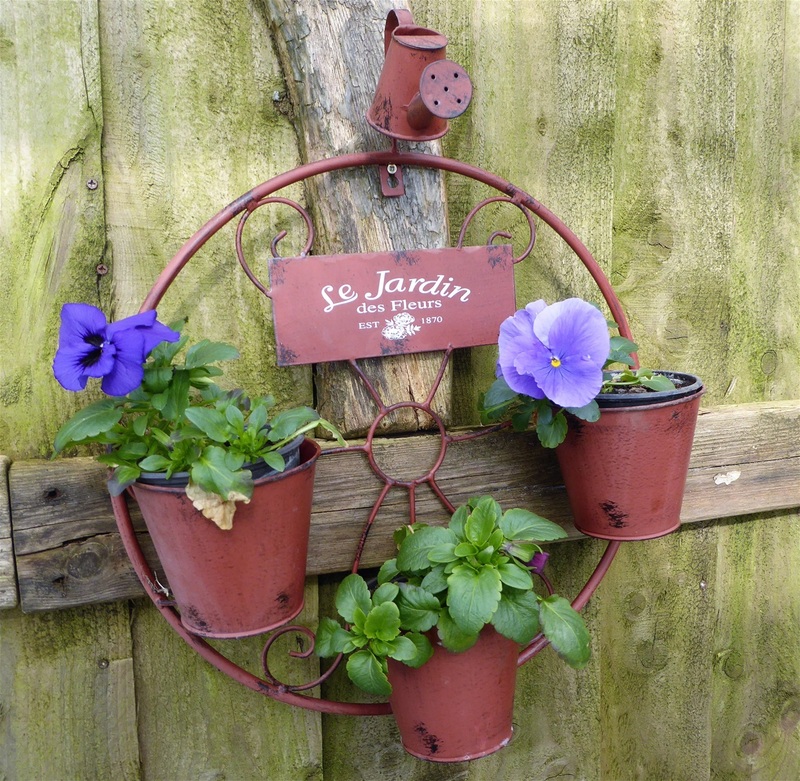 The pansies in our seating area at the plots are protected from the worst of the weather and are looking very cheerful, although it is much too cold to be able to sit and admire them right now. Thank you to the huge number of you who have found the Sowing & Planting Plan interesting. I am hoping it helps me keep on track better than last year, and may give you some ideas too.. hope so. I shall be back next Monday, with March's first entry. hopefully with some of the seedlings planted in the polytunnel and the first lot of carrots sown too. Depends on how much snow we get! The added bonus is that all the seeds are now sorted too, and the couple of things that I need, such as Chinese Dragon winter radish seed, will still be in stock at this end of the year. Virtual growing was better than nothing, and it kept me busy. 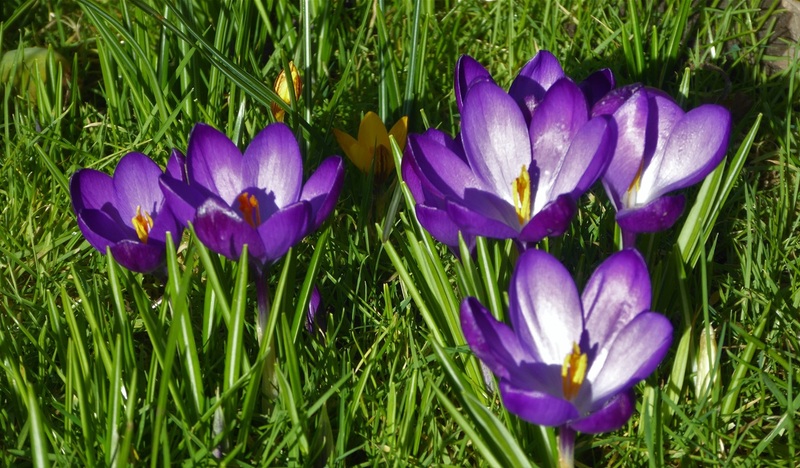 There are still plenty of yellow crocuses in the lawn, but they were joined this week by some of the early purple ones. It seems odd not to have seen any bumble bees or butterflies out in the sunshine yet: there are usually one or two by now. When I was a child, these were available in little cardboard boxes as a snack item, but these seem to have been unavailable for quite some time. 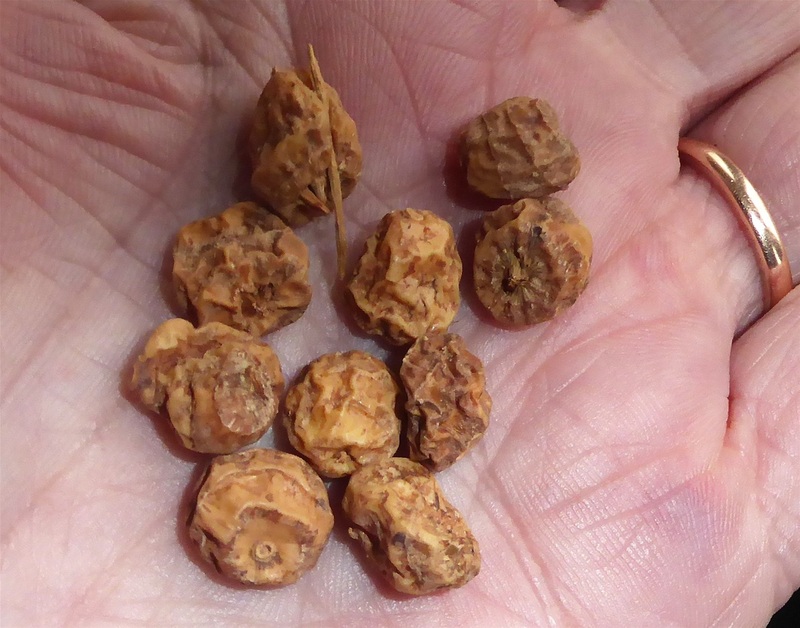 I had ten tiny tiger nuts for Christmas, so I thought I'd better find out how to grow these on. I am liking the sound of these more and more, so hope that the ten peanut-sized wrinkled tubers are enough to give a good crop. 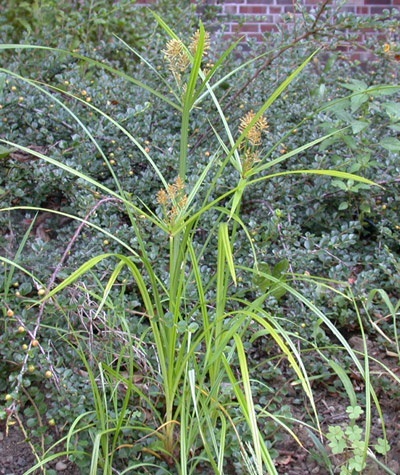 Aparently the grassy leaves grow about 90cm tall, but it is unclear as to whether they flower in the UK. Some growers have said the tubers are popular with mice... hmmmmm...maybe grow them in large pots rather than in the ground, given the numbers of rodents that live around our plots! My ten are now in soak in a bowl of water in the kitchen, and will be planted in individual three inch pots tomorrow: I'll let you know when they start to grow! 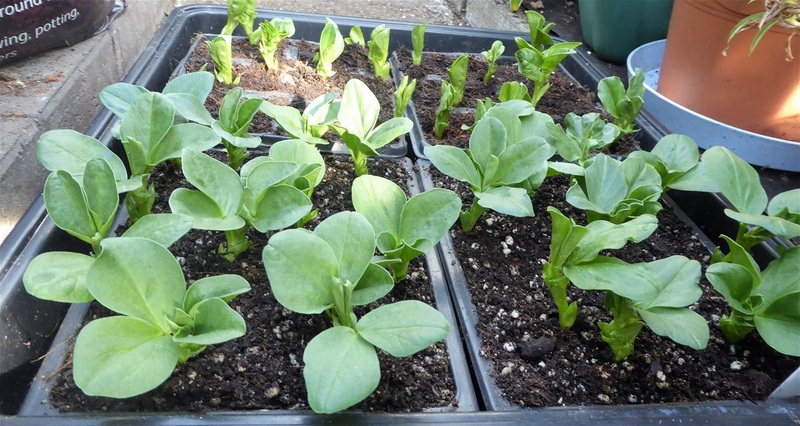 The seeds sown in the greenhouse have mostly germinated (What is wrong with these lettuces? Thye weren' that old!! I shall have to sow some others), and it has been interesting to see which beetroot are first out of the traps: Subeto. Will this also mean they are the first to mature? All the broad beans are showing their heads too. 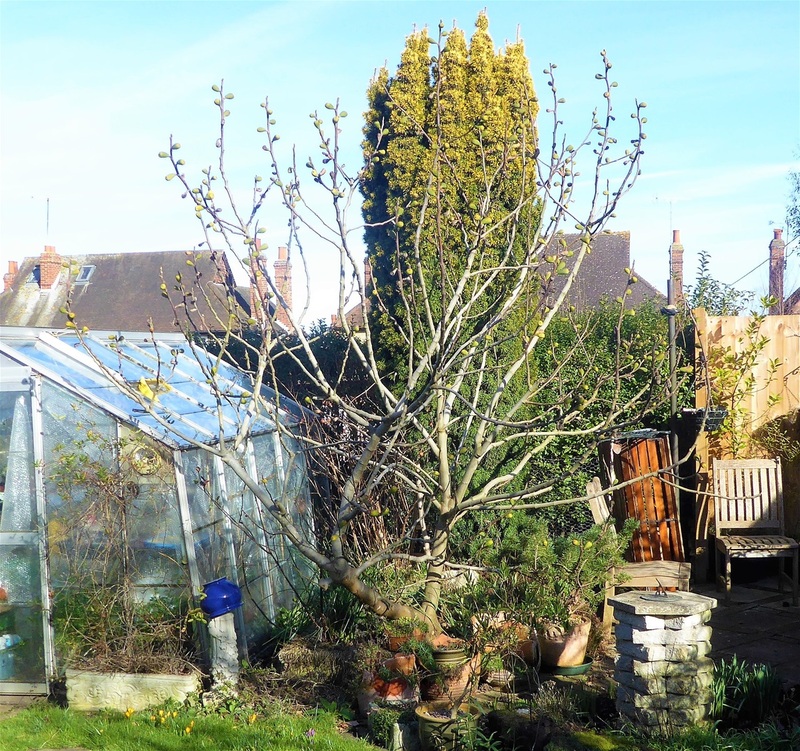 They do not need to be in the warm at all, so will be going to the giant cold frame on the Plot 146 as soon as they are hardened off. The chiliies and peppers are now ready to pot on, which will increase pressure on space alright! I hope that I shall be able to do a little more in this coming week and get more seeds, sown, espacially the leeks. Oh, forgot to say the radish seeds sown in the polytunnel bed have germinated. It'll be a while before they are able to be harvested but at least it is something to look forward to! I'll be back next Monday. 12th February - Not much to report this week, as it has been very cold and as I feel quite unwell right now, digging out bark from the paths in the freezing cold seemed a bridge too far. We have had no fresh harvests for Harvest Monday, although we have plenty of food in store. We have had two family birthdays to celebrate as well. 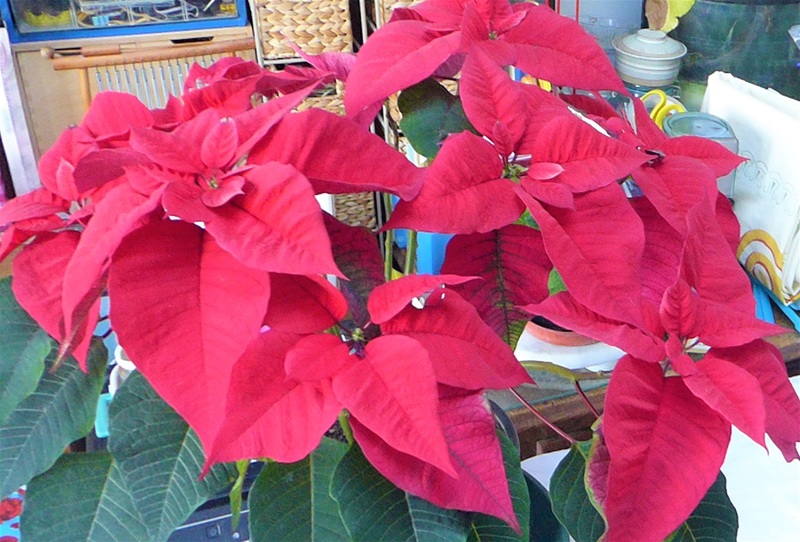 The Christmas Poinsettia is still looking good, so I thought I'd share it with all of you! This is the end of the most recent blog entry. It eems odd to record we have done so little but I don't feel we are behind at all. 5th February - Cabbages RUs!!! This week I decided that the outer leaves of the remaining cabbages had gone as brown as I dared let them, and so rather than risk them starting to rot and spoil the inside of the heads, I cut them all and brought them home. They are now happily residing in the garage fridge, where they will be safe for a few weeks. We have already had Cabbage and Coconut Curry, using one of the smaller savoys. (Recipes 2018). The last ballhead cabbage weighed in at 3.3kg after all the outer leaves and stalk were removed, which is, as one of neighbours observed "Quite a lot of coleslaw"
Harvest Monday started well with the cabbages, and continued with leeks, which are still standing well. These ones combined well with the last of the tiny Brussels sprouts to add to our roast dinner today. The potatoes are still good to eat, especially the Kondor ones which "fluff" nicely when roasted, but we have finished our stored carrots, so bought some. Wow, what a difference in flavour from the ones we grew ourselves. Not much taste of carrots to be honest.. If I ever doubted it was worth the effort, this would have convinced me to go out and buy a packet of carrot seeds!! It has been a busy week though, focussing mainly on sowing the early crops to grow on in modules in the greenhouse at home: Kent Blue and Indian Blue Mangetout, early peas Hatif d'Anonnay, with Hurst Greenshaft to crop slightly later, Beetroot (Orange Boldor, Subeto, Bono and Crimson Detroit) some Little Gem lettuce seeds, as well as some crops that will be planted in outside beds when they have been hardened off in the giant coldframe: Wizard Beans, Red Epicure Broad Beans, Spring Onions White Lisbon and Lilia. I must sow the maincrop leeks too. Another thing to add to this week's list! 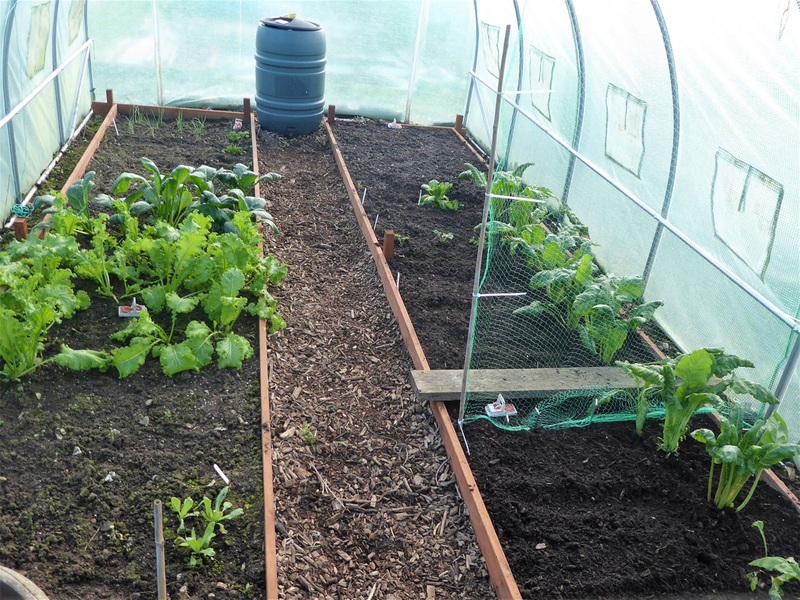 The weather has been relatively mild, so I moved several barrowsful of wood-chip compost into the polytunnel beds, which are now ready for the new season's crops. 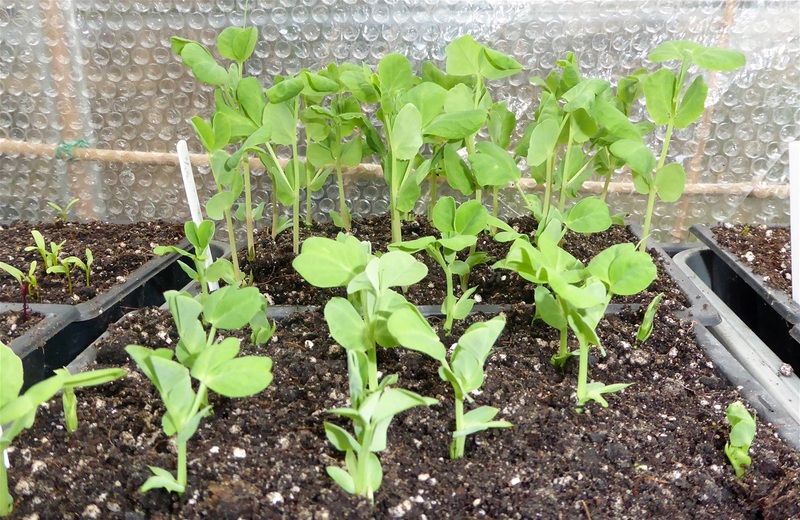 I sowed some Cherry Belle radish seed ....three shortish rows... as the soil felt warm enough for them to germinate. A cold spell is forecast this week, but it is worth taking a chance on them. Seed is cheap and plentiful, and we might get a small crop in a few weeks' time. Who knows? The chilli seedlings have adjusted to life out of the propagator, although it will be a while before they grow proper leaves. I still couldn't find the Sweet Piquante seeds, despite searching everywhere I could think of, so I sent for some more. 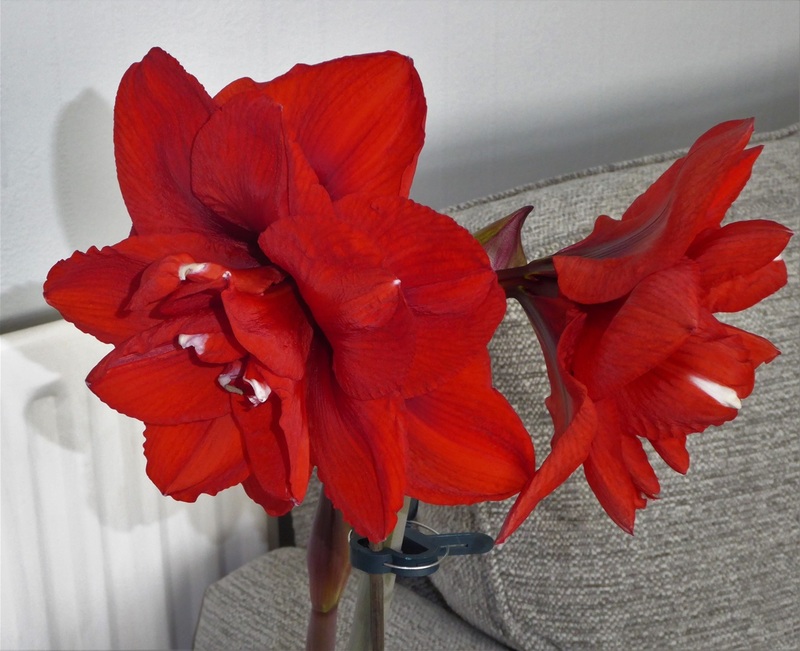 I sowed them immediately they arrived. I do hope they grow well, as the thought of being able to have our own home grown "Peppadews" is mouthwatering. 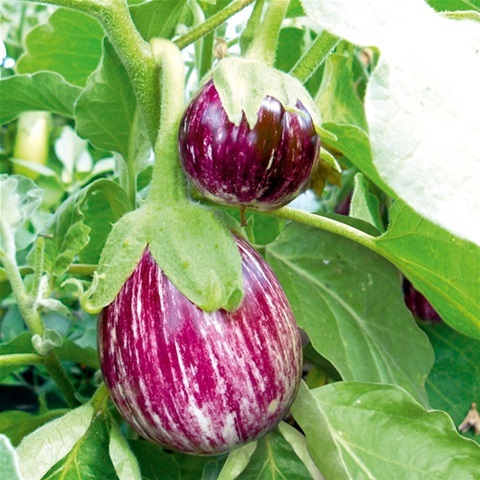 I also put in a couple of Pinstripe Aubergine seeds, as the picture on the packet looked very tempting, as you can see here. The Black Beauty seeds germinated within a week, so I hope these come through as quickly. 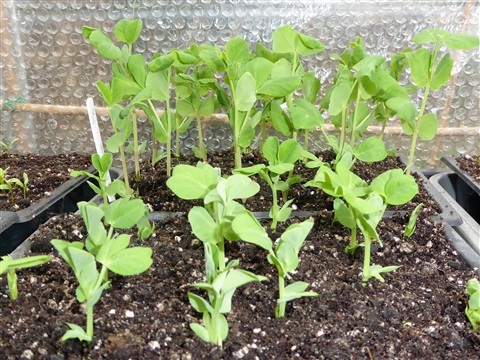 Sweetpea seeds are now sown too, four to a five inch pot. 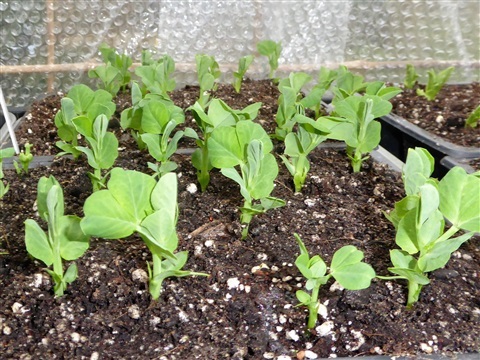 Once they are up and growing away, they can go into the giant coldframe. 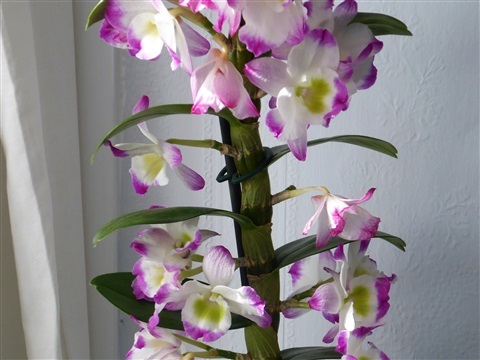 I have tried growing them in toilet roll tubes and in 3 inch pots, but have found they get a bit straggily before it is time to plant them in their permanent positions, despite being pinched out and fed. By using larger pots I hope the roots have space to help develop good strong plants. January ended with a Blue Moon, the second full moon of the month, and gloriously bright it was too. The clear skies of course mean frosty nights, but also sunny days. This Viburnum bodnantense 'Dawn' grows behind the garage at home. We also have a small bush on #146. 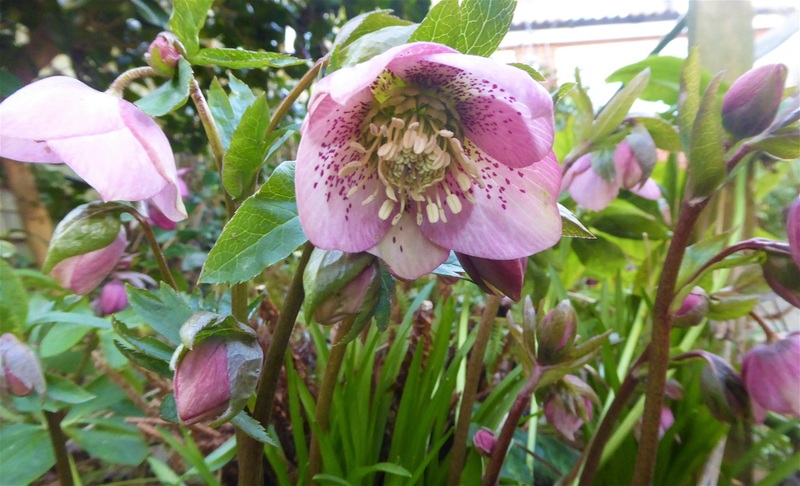 They have both been flowering since November, and their pretty pink sweetly scented flowers against a clear blue sky feel like a real harbinger of warmers days to come.